"Here’s my platform. I’m stood on my platform, waiting for the train. But the harder I wait the less the train comes. It’s a paradox. The train will never come if I wait for it, however hard I wait. So I go to my park. Here’s my park. It’s got grass and trees and things. There’s places I can go and just not worry about trains. So I stand on a pole and start not to worry too much about trains. Soon I’m not worrying about trains at all. And then my feet leave my pole and I ‘m lifted to the sky. I’m flying. I look down at my park and there are other people in my park. They’re not worried about trains. They’re just doing whatever it is they do. Before I know it, I’m way, way up in the sky. I’m so far from worrying about trains that I’m playing with the planes. The planes are orange and Easy. Not like the trains. Oh, the trains. I need to get a train. I’ll never get a train up here. I need to get a train. We all need to get a train. Where are the trains? So I’m back at my platform. 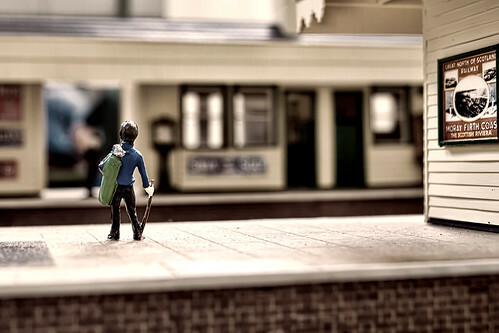 I’m stood on my platform, waiting for the train. But the harder I wait the less the train comes. I know there are trains. I’ve been on trains before. They took me right where I wanted to go. But there’s no train here. Maybe I’m waiting too hard. Wait, here comes a train! I think that’s a train I can use. Let…Oh. It’s gone. Still, there’ll probably be another one. You know, wait hard enough for one train and they all come at once. But wait. It’s not just me. There’s other people here waiting for a train. Other people trying too hard to wait for a train. I wonder if they have a garden? Or a pole? I wonder if they fly? I wonder what kind of trains they’ve been on? So we talk. We talk about gardens. We talk about poles. We talk about flying. And we talk about trains. It turns out we’re all waiting too hard for our trains and those trains just never seem to come. Maybe we should stop waiting so hard. And you know, as we’re talking…a train arrives. We’re not sure where it’s going, but its there, all the same. And then another arrives. We’re not really sure where that’s going either, but it looks kind of interesting. And more and more trains arrive. Until there’s so many trains that we just don’t know which ones to ride on. But it’s alright. Because we’ll just try a few and see where they go. We don’t have to go all the way, but it might be interesting so see what happens. How about we just take a train each? We could meet back here and tell each other how it was. If we really like one, let’s take it all the way together. Here’s my platform. I’m waiting for the train. But I’m not waiting too hard. Seems to me, the harder you wait the less the train comes. Anyway, my friends will be here soon. We’ll not wait too hard and just see what happens."